The scriptures we are contemplating today all have something in common; they each are related to words spoken. The importance of words cannot be overstated. What we say is giving shape to what we will have. 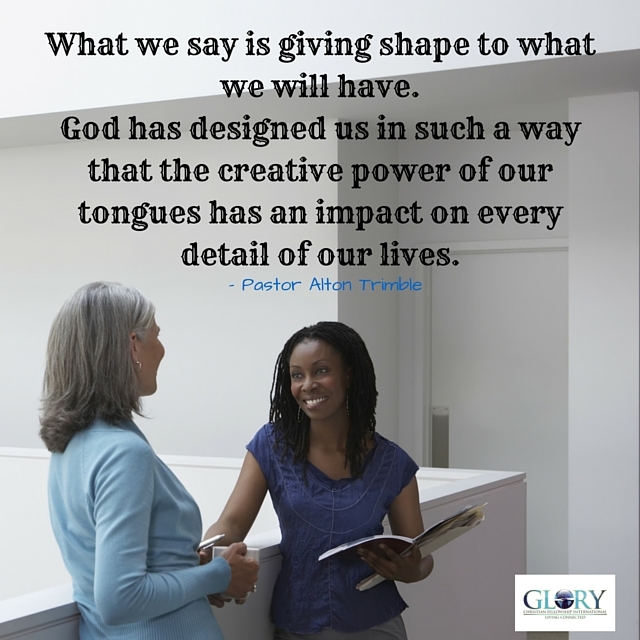 God has designed us in such a way that the creative power of our tongues has an impact on every detail of our lives. One can only imagine the number of things that we have talked ourselves out of or into, whatever the case may be. 1. Proverbs 15:1 – A soft answer turns away wrath, but a harsh word stirs up anger. • The smoke we smell around us may be the result of our failure to deflect the flame that started it. 2. Proverbs 15:2 – The tongue of the wise uses knowledge rightly, but the mouth of fools pours forth foolishness. • The antidote to bloviating is a wise word. 3. Proverbs 15:4 – A wholesome tongue is a tree of life, but perverseness in it breaks the spirit. • Gentleness in speaking ensures the well-being of a spirit. 4. Proverbs 15:7 – The lips of the wise disperse knowledge, but the heart of the fool does not do so. • Good advice is the result of abandoning foolishness and delighting in wisdom. 5. Proverbs 15:8 – The sacrifice of the wicked is an abomination to the LORD, but the prayer of the upright is His delight. • A prayer is never the wrong articulation. 6. Proverbs 15:18 – A wrathful man stirs up strife, but he who is slow to anger allays contention. • Matching the intensity of the unwise will cause you both to burn. 7. Proverbs 15:22 – Without counsel, plans go awry, but in the multitude of counselors they are established. • Three points on a curve provides a much safer view. 8. Proverbs 15:23 – A man has joy by the answer of his mouth, and a word spoken in due season, how good it is! 9. Proverbs 15:26 – The thoughts of the wicked are an abomination to the LORD, but the words of the pure are pleasant. • Pure words are those motivated by the Spirit of God. 10. Proverbs 15:28 – The heart of the righteous studies how to answer, but the mouth of the wicked pours forth evil. • How many things could we have avoided saying by just a moment of careful thought! I enjoyed this reading today. I know that my impulsivity can be the reason people don’t see Christ in me. So, Lord God, please help me resist the ability to speak without saying the words You ordain for me. I trust You today, to be my mouthpiece. In Christ, Amen. Thank you for todays word Lord. I can’t count the times my mouth has gotten me into or out things. Very important to apply these scriptures before we speak. Father help me to guard my tongue and think before I speak, allow and encourage me to use kind words and words approved by You! Continue to give me devine direction in every detail of my life, overflow me with wisdom and the desire to do Your will, in Jesus’ mighty and matchless name, Amen! Thanks for Manna for today, because of the things I say, said, did, and do have gotten me into and out of places, and situations that was very uncomfortable, and unpleasant to be in. In those experiences I continue to pray to you FATHER IN JESUS’ NAME and believe that you will and have help in times of need to give me the right words to say and the right attitude to display whenever I encounter them. We all have areas in our lives or situations where we need to “tame our tongue” and watch what we say. I pray for the patience and proper attitude so that I can speak life into even the most stressful situations. Wow, I can’t tell you how may times I’ve had to pray to “tame my tongue”. This is a daily prayer and a consistent practice. I’ve learned to think first before I speak because if I don’t my tongue will definitely deliver a negative delivery and in turn will result in a negative response. Thank you Lord for your patience and grace!! !